So here I was about to sleep last night but decided to slap on a face mask . This is something which I don’t really enjoy doing…I still have the masks she bought me from her trips 3 years ago! 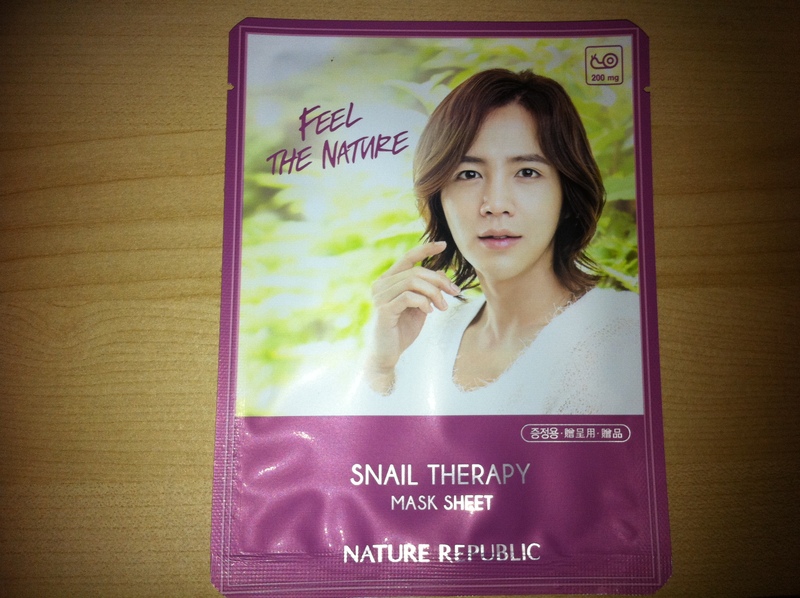 Anyway, I picked a mask that said ‘Snail Therapy Mask Sheet’. Yep, you read it right, Snail Therapy. I wondered if it was just a term for something else so I read the tiny words on the back of the pack (thank goodness it has English description). Guess what? It really does have snail in it! One of the main ingredients listed is snail secretion…I just typed excretion! YIKES! What’s wrong with me? As if I’d slap those stuff on my face! Oh well, if they have salmon eye mask, what’s wrong with snail mask? So I was covered in snail secretion and looking like the murderer in Friday the Thirteen, what’s-his-name. One of the reasons I hate doing mask is that none of the mask sheets actually fits my face properly. They are all too big and they leave the chin part hanging down, making me look as if I’ve grown a beard, a la Santa Claus LOL! They really need to start thinking of making the masks in different sizes! In case you’re wondering, no I didn’t end up looking like the person on the mask packaging. And don’t ask me if I feel good after the mask cos I fell asleep immediately after removing it. I really should try to sleep early…might not need any of these strange masks at all if I’m well rested. Can somebody lock up my pc?? ?